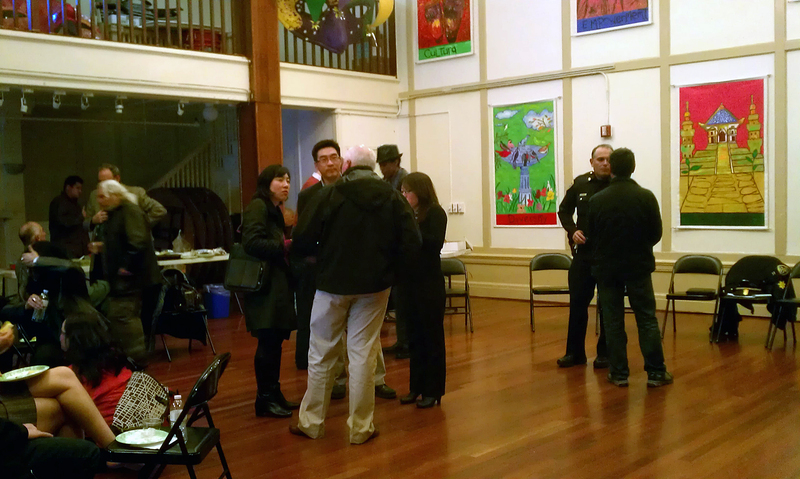 Merchants and residents chat with Mission Police Captain Robert Moser. Mission Police Captain Robert Moser promised on Thursday to keep working closely with neighborhood organizations. “As law enforcement we have to respond to short-term problems and we need to think about long-term solutions,” Moser said during a reception held in his honor at the Mission Neighborhood Centers on Capp Street. Partnering with community organizations is a good way to address neighborhood issues, he added. The reception brought out approximately 30 people, including Medjool owner Gus Murad and Michael Gardner, the president of Siegel’s clothing store on Mission Street. It followed a meeting with Homies Organizing the Mission to Empower Youth and members of the Community Response Network, an organization that works with at-risk youth. “Captain Moser is really giving one-on-ones here,” said Phil Lesser, a board member of the Mission Housing Development Corporation and former president of the Mission Merchants Association. Merchants can play a part in fighting crime by communicating with the police and just being present, Lesser said. Thursday’s event came on the heels of three shootings last weekend that left residents on edge. The shootings took place early Friday at 24th and Capp streets, early Saturday at 24th and Shotwell streets, and late Saturday night at 22nd and York streets. The gang task force is investigating all three. Crime affects the neighborhood economically, said Erick Arguello, president of the Lower 24th Street Merchants and Neighbors Association. When a series of shootings happens, people tend to stay away for a while. At Thursday’s meeting, Moser, who recently started inviting members of the Community Response Network to join officers on night patrols, said that more representatives of the youth organization should join officers. Getting to know each other better will make for a better partnership against crime, he said. The network’s members, strongly rooted in the community, have helped authorities by talking to young people in the neighborhood to calm tensions that arise between different factions. Moser said the community network has helped explain the police investigative process to families that are victims of crime. In a homicide case, for example, the victim’s body must be kept at the crime scene until the medical examiner arrives; network members can help explain this to relatives and friends who are upset that the body has not been removed. “From Day 1, the captain has reached out to us, and we’ve had an open-door policy with him,” said Ricardo Garcia-Acosta, the regional director for the Community Response Network. Many in attendance seemed happy with the work Moser has done in the neighborhood since he was transferred in January. “I think we’re going to get somewhere with this guy,” Garcia-Acosta said. “Hopefully they don’t transfer you out in two years,” he said to Moser, referring to former Mission Police Captain Greg Corrales, who was transferred to San Francisco International Airport in late January.